Wow! 50% off with coupon code ENI57CHG. 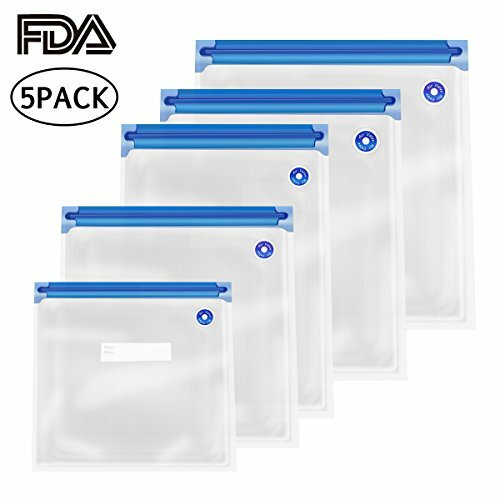 5 Different Sizes-The sous vide bag set included 5PCS in 5 sizes from 8.64*8.25 inch,10.21*11inch,8.64*13.36 inch,10.21*13.36 inch to 11.79*13.36 inch,which can be meet your various demands. FDA Approved-Made of polyethylene food grade material,it is safe for sous vide cooking or food storage.It is also reusable,durable and washable. Easy to Use-Put food in the bag and seal it with the white bag sealing clip.Take a few seconds to squeeze the air out and keep the bag sealed tightly.The label on the bag can be written to record storage deadline. Multi Functions-It helps to keep your food fresh 5 times longer than other traditional storage methods by blocking oxygen and moisture and retarding oxidation and growth of bacteria.Also widely used for sous vide cooking. Tips for Sealing for Sous Vide Cooking-To get a fully sealed bag without hand pumps,you can put the half-sealed bag in the water and gradually squeeze out the remaining air out and have it fully sealed. Double check the bag to make sure they are fully sealed before putting it submerged in water.